A long-gone blot on the Belfast landscape has been hurled into the centre of a growing international row that could threaten the future of one of the United States’ top broadcasters. Irish-American cable news presenter Bill O’Reilly – the biggest name in the Fox News galaxy of stars – has come under fierce pressure in recent days over a series of past comments that he made claiming to have witnessed violence in some of the world’s most infamous conflict hotspots at first-hand. Mr O’Reilly is already under intense examination over claims that he witnessed nuns being “shot in the back of the head” in El Salvador in 1980 and over his vivid description of violence in Buenos Aires after the end of the Falklands/Malvinas conflict in 1982. Now the newsman’s claim in a 2013 book to have seen “Irish terrorists kill and maim their fellow citizens in Belfast with bombs” when he accompanied the RUC on a raid on Divis Flats in 1984 has poured petrol on the flames of an already intense media blaze. 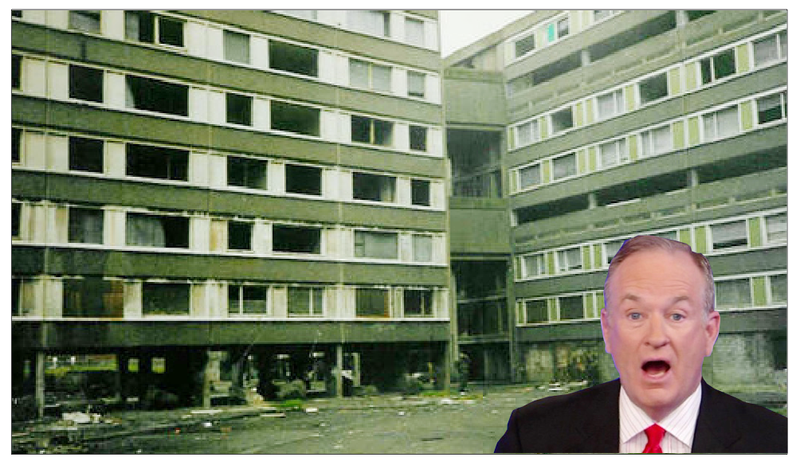 On Friday a Fox News spokesman said that Mr O’Reilly had not in fact been an eyewitness to killings or maimings at Divis Flats, but had been shown photos of the aftermath of bombings by RUC officers. And in an interview on a Massachusetts radio show, he himself rowed back from the claim when asked about it by host Hugh Hewitt. “We went on a raid in Divis Flats with the police and it was a pretty intense situation,” he said. “There was stuff being thrown, arrests being made, all of that.” When asked by Mr Hewitt if he felt in danger during the Divis Flats raid, Mr O’Reilly said he did not. Mr O’Reilly has been the biggest star of the lucrative and intensely competitive US cable news scene for more than a decade, last year earning an estimated salary of £7m. His media opponents have fallen with ill-disguised glee on his current difficulties and the ins and outs of his past conflict reporting have been widely reported by other networks and by the leading US newspapers. Online it has proved something of an obsession. But just as Fox boss Rupert Murdoch stood by Rebekah Brooks during the recent phone hacking controversy, so Fox News is standing by its man, despite the fact that NBC anchor Brian Williams was last month hit with a lengthy suspension for embroidering a story about his reporting of the Iraq War in 2003. Murdoch’s decision to stand by Brooks is said to be down to personal affection, the Fox News decision to stand by O’Reilly, though, is much more hard-headed. His daily show, The O’Reilly Factor, is the network’s biggest earner in ad revenue by far and, crucially, while Divis Flats came down in 1993, after a week of unremitting criticism, O’Reilly’s ratings have gone up.